Companies are making it even easier to support non-profit organizations by allowing customers to donate to charities while making everyday purchases or doing daily activities. That includes big guys like Amazon and American Express, as well as GoodSearch. 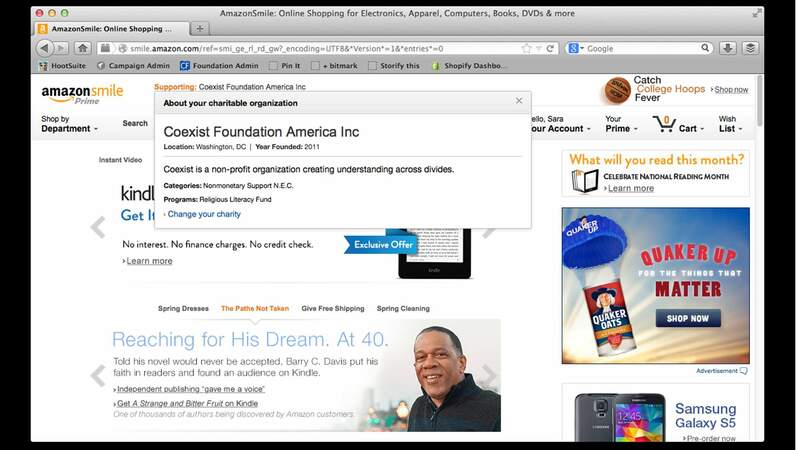 Amazon recently launched AmazonSmile, a simple and automatic way to donate to your favorite charitable organizations while shopping. Start by going to smile.amazon.com. If you already have an Amazon account, you can use the same username and password. If not, you will need to create an account. From there you just choose your favorite charity and .5% of your eligible AmazonSmile purchases will go to them. Shop like normal and help a good cause (FYI: not all Amazon items are available on Smile, but a lot of them are). Members Give℠ is American Express’s program that allows its members to use their credit card for charitable giving. Amex customers can do things like donate dollars or redeem membership reward points for a donation. You can even set up recurring donations or spread a donation out over time. GoodSearch has multiple ways to do good on the web, all of which live at DailyGood, a site that allows you to raise funds for your favorite non-profit by searching, playing online games, shopping, dining out, and more. You can sign up using Facebook or email then shop, search, and play to donate. The amount DailyGood donates depends on what you’re doing, so by checking the weather you will raise $.01, but by shopping online at Kohl’s you’ll earn 2% of your purchase total for your charity. We found another one! PopNod is a D.C-based (so local to us) company that helps you get cash back for your online purchases at 286 online retailers - cash that you can designate to go to a charity. The list of stores is impressive and varied, including Amazon, Living Social, Sephora, Target, Best Buy, Lowes, Macy’s, Patagonia, and Priceline. Sign up for an account (it’s easy - just name, email, and password), pick a cause, and designate how much of your cash back should go to them. Then, as long as you go through PopNod to get to the stores' websites, you’ll be earning cash back. Help us out by doing the things you normally do. Set up an account on any of these sites and search “Coexist Foundation America, Inc.” (or just Coexist) in the list of charities. By making this quick and easy change, you can help us grow as an organization and continue to create understanding across divides. Have we missed a way to passively give? Send us an email.